Lot Detail - Eric Lindros' 1993-94 Philadelphia Flyers Game-Worn Alternate Captain's Jersey with His Signed LOA - 44-Goal Season! 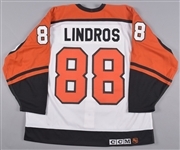 Eric Lindros' 1993-94 Philadelphia Flyers Game-Worn Alternate Captain's Jersey with His Signed LOA - 44-Goal Season! Worn on the back of superstar centerman Eric Lindros during the HOFer’s sophomore season, we have a Philadelphia Flyers alternate captain’s jersey donned by The Big E during the 1993-94 NHL season – a campaign that witnessed 97 points including 44 goals. A Maska Air-Knit label graces the collar along with a size “56” fly tag, with embroidered NHL and CCM crests over the reverse bottom hem. 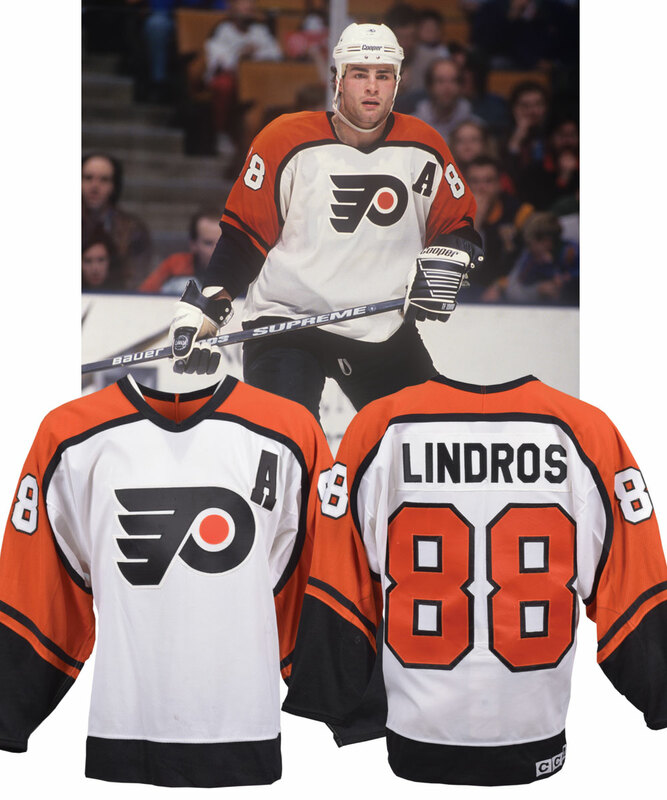 Styled with the forever popular winged-P Flyers team crest, the mesh-style V-neck has been accented with oversized tackle twill sleeve and verso numbers, with “Lindros” across the nameplate in single black twill. Both Eric and the Flyers’ team trainer have signed the reverse of the team crest in black marker, adding “93-94”. A signed LOA from Eric Lindros will accompany. A few marks are visible over the front just above the lower band, with burns over each sleeve including a small resulting hole over the left elbow. There is also paint transfer over the right sleeve’s number.